It’s New Year’s Eve. We have eaten our roasted pepper soup, enjoyed a cheese plate and look forward to our pal Jan’s shortbread, as we toast a CNN New Year’s. In San Diego, this means we can go to bed shortly after 9:00. I have to admit, I will be ready for an early bedtime. This has been a difficult season, to be sure. Despite some party invites, we are staying at home, mostly because I feel emotionally pooped. I never know when the holiday gremlins will show up, but they did this year, in force. My first hint of their arrival was when I burst into tears a week ago Monday, looking for red tulips to honor my folks. I used to take them to the cemetery, but in recent years they decorate a nice photo of my parents. After two visits to reliable florists, I fell on the florist at our local supermarket, who sold me two bunches of perfect tulips for a bargain. I plodded through Christmas Eve and Day, thankful for support from Larry and the arrival of our friend for two nights. George lost his beloved wife last February, yet was such a charming and easy guest – everything worked. Jan was a delightful addition to the day, sharing stockings and treats. But shortly thereafter, Larry dropped something and chipped our sink in the new bathroom of 35 years. I fell apart and I am still apologizing for the tantrum that ensued. A new sink sits in the garage, awaiting the (expensive) installation by our reliable contractor. OK, the tree is down and recycled, the roses are pruned and we will celebrate the New Year at a huge gathering tomorrow at Jan’s mid-day. Larry and I will walk the beach at Coronado in the morning. 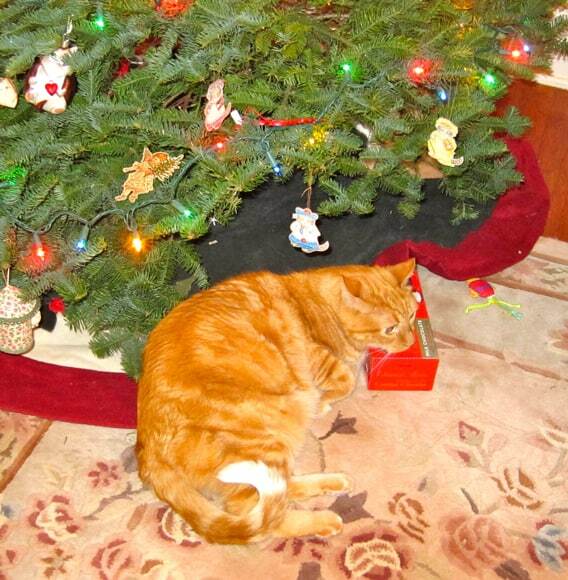 The kitties are aging – here is Buddy, arthritic at 13, but ever my loving boy. I celebrate them every day, the heart of our household. Who knows who long any of us will last? The holidays can bring a ton of mixed emotions – it is a time to be cheerful, the New Year announcing “new-everything”, decisions, evaluations… but it is a time in which the void of loved ones is particularly hard to put aside. I say….. don’t be too hard on yourself… you are not a machine, and that is a wonderful thing in itself! The holidays are bittersweet, evoking the highs and lows of our memories. It doesn’t help that the end “of another year” arrives before we have time process all the holiday activities, expectations and emotions. For me, trying to stay in the moment by getting my hands busy doing something I enjoy is the best therapy. My mind seems happy to follow along (most of the time!). I hope the New Year brings more peaceful memories Liz! Liz, I love your honesty. The holidays though joyous for most can dredge up less than happy memories especially when we have loved ones that have passed. I know how you feel, Buddy is so handsome. I have two senior pugs with severe health problems and I celebrate every minute they are with me. I hope 2014 brings you and yours good health and happiness. Oh Liz. I can so relate to you, this post touched me deeply. There is no going back and life can be so difficult. Sending you love from afar. I am so thankful that you have both of your kitties and Larry with you and the kindness of friends. Life is so very fragile and here we are living it minute to minute. The holiday season can be so difficult, for many reasons. You share an important point that we should all be grateful for what we have. I hope you have a have a happy new year. Oh Liz – I’m sorry to hear about the sink, and I say that with all honesty and I know how anticipated the new bathroom was and how much energy and time it required! I’m looking forward to seeing you next week! Elizabeth Ann (May I call you that?). I hope so, because what I have to say is fundamental. Elizabeth Ann sounds very studious indeed. She’ll listen to me. Embrace your feelings, Elizabeth Ann. It sounds like you are in safe company. Larry, Jan and Buddy will be there for you. We here (in blog land) are here for you too. Of course, Elizabeth Ann sounds like a smart cookie. So she probably knew all of that already. I hope you’re feeling better, enjoying your friends and kitties and that the New Year is off to hopeful start. Take good care!